Riding high on the continued success of Cut the Rope, developer ZeptoLab serves up victory pudding, only this pudding doesn't want to be eaten or smeared on the naked bodies of unpleasant people. Pudding Monsters wants to be free. And who could blame them? Sitting in the fridge day in and day out, fearing the bright light of the door opening, heralding the demise of one of your friends or worse. Desperation forced the Pudding Monsters to come to life, join together and escape, and you're going to help them. A fresh take on sliding puzzles, Pudding Monsters challenges players to bring together an array of eyeball-sporting pudding mounds to come together into one large, delicious creature. More than that, the resulting creature needs to come to a rest on the three stars scattered across each level in order to be the very best pudding combiner you can be. Play with your food incorrectly and it goes sliding off the shelf/table/block and you've got to start all over again. It's a clever little game that grows more complicated as new mechanics are introduced. Green puddings leave a sticky trail behind them that can catch sliding buddies before they reach escape velocity. Sleeping puddings require a gentle nudge to get them going. Some puddings move as a unified group. Duplicators, ice blocks and bounce pads further muddle matters as you tear through the game's initial 75 levels. And you will tear through them, which is a bit of a problem. I felt like I was just getting into the swing of things when I reached the final stage, unlocking three bonus levels and the promise of more content on the way. ZeptoLab has been great about adding new content to Cut the Rope and Cut the Rope Experiments, so I've no doubt they'll be more Pudding Monsters soon. I guess I should spend the time between updates eating my meat—how can I have pudding if I don't eat my meat? 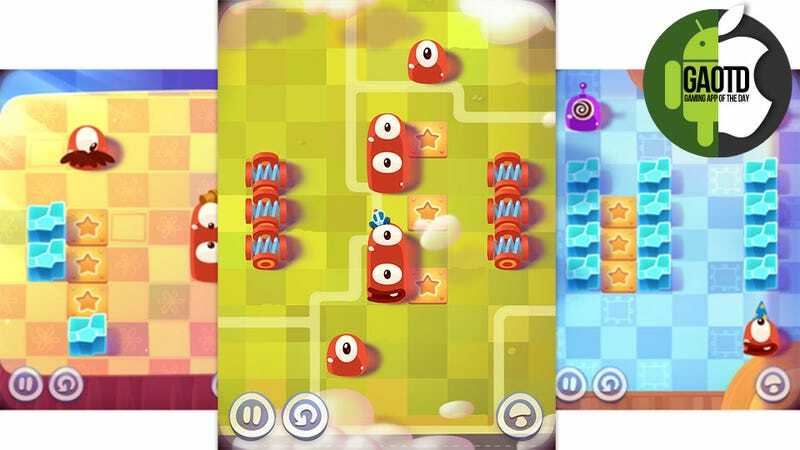 Pudding Monsters is a fine follow-up to the candy-chomping antics of the adorable Om Nom. Do I smell a crossover? Nope, that's just me. Sorry. Available today on Google Play for Android — Here's the link.